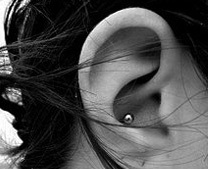 Conch piercings are a popular type of ear cartilage piercing. They are relatively easy to heal but special care should be taken with any cartilage piercing. Provided that you take proper care of your conch piercing, it should heal well. Conch piercings typically take between six and eight weeks to heal. Conch piercings are usually pierced with a small barbell. Ball closure rings can also be worn in conch piercings, but they are not advised while the piercing is healing. This is because they are more likely to get caught on clothing and can be uncomfortable. A labret stud is also ideal for conch piercings and some people find them more comfortable. Conch piercings require the same aftercare as any ear cartilage piercings. They should be cleaned twice daily with saline solution and kept dry. Swimming and submersion in water can introduce harmful bacteria, so they should be avoided. Try not to fiddle with your piercing or touch it too much, as this also introduces bacteria to the piercing. It is important to monitor any new piercing for infection but I recommend being especially vigilant with a conch piercing. This is because infection can become trapped in between the layers of ear cartilage. If this happens, infection can spread and even destroy the cartilage. Provided that you take proper care of your conch piercing, the risk of infection is very low. But if you experience pain, redness, swelling or any unusual symptoms please consult your piercer immediately. Once your conch piercing is healed, it requires very little care – simply clean with saline as needed. If your piercing becomes sore after it has healed, you may find titanium, blackline or BioFlex jewellery more comfortable. This entry was posted in Body Piercing Aftercare, Body Piercing Education, Ear Piercings and tagged Body Piercing Care, Conch Piercing Aftercare, Conch Piercings, ear cartilage piercing, Ear Cartilage Piercing Aftercare, Ear Piercing Aftercare, How To Care For Body Piercings, Piercing Aftercare on April 16, 2013 by Piercing Guru.